The new revised edition is now available from Capall Bann Publications, price £13.95. Please buy it direct from their website. Originally this text was a short essay entitled: "Finding Your Way in the Woods: The Art of Conversation with the Genius Loci". It arose from a discussion at the first Treespirit Moot at Hawkbatch Farm in 1990 & was self-published & offered by mail order in 1991. I originally wrote it on my Amstrad CPC6128, (a pre-PC machine) & it has been out of print for some years. Encouraged by my wife Anne & other friends I kept writing on the subject & eventually an entire book of 272 pages emerged! The book was published in October 2005 by Capall Bann Publications. You can buy it by clicking on the above link, which will take you to the book's page on their site. If you buy it anywhere else you might get an old one. 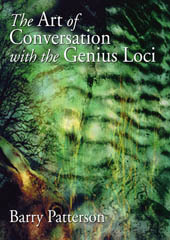 The Art of Conversation With the Genius Loci looks at the relationship between our spiritual path and our immediate environment. The mystery of place - finding our place and developing a relationship with it - are a powerful, if simple, magic and are also an ideal reference point from which to examine broader issues. As a society we are insulated and alienated from nature and tend to look at it from an idealistic or political viewpoint. The problem of our loss of integration with the environment isn't just a physical one about pollution or an ecological one about our present lifestyle not being sustainable, it is also at the heart of the spiritual crisis which our culture has created for itself. This book is aimed not only at modern pagans who are already engaged with these ideas, but also at people who have a more general interest in ecology and spirituality. In a down-to-earth and practical way it suggests ways for people to explore, find and make deeper contact with their own special places. There is also a very personal journey through the inner landscape of the mind and the book deals with various methods of dealing with the issues that outdoor meditation and magic are likely to bring up, including privacy, safety and protection for both the place and the person. Barry Patterson has been inspired by the natural world, whether wilderness or puddle, all his life. He works as a freelance educational performer and teacher specialising in science and natural history. Apology: in a number of places in the text of the first edition, I wrongly attribute the line: Fair things pass by unheeded as the threshhold brook, to Larkin, but it is of course from The Seasons of Man by John Keats. Foreword: The World by Gordon Maclellan. 1. The World of the Laughing Gull - An autobiographical piece. 2. Basic Approaches - Finding a Place - Other People - Know Thyself - Really Being There - The Power of Giving - Labour of Love - Standing & Sitting Still - The Power Principle - Earthing the Charge. 3. Going Deeper - Working with the Circumstances - Firelight - Games to Play: The Magical Mystery Tour, Tell Me a Story, Mythago Wood. 4. The Great Directions - What is Actually There? - The Numbers Game - Attributes of the Directions in Different Systems - The Cross Quarters - The Centre - The Temple & the Glade. 5. The Hamlet Syndrome - The World of Animism - The Tree Man - A Warning? - Little Things - The Hamlet Syndrome - Dualism & Mysticism. 7. A Statement of Intent is Not Enough - The Art of Magic - Stuff Happens - Tying Knots - The Western Way? - Approaches to Magic - Singing a Rune - Ecology & Magic - Holistic Magic - Working on Ourselves - A Statement of Intent is Not Enough. 8. The Living Bedrock of the Land - Science, Art & Magic - What Makes a Sacred Site? - Geological Maps - Minerals, Crystals, Stones & Rock - Types of Rock - Shapes in the Land - Practical Work - Danger - In the City. 9. The Plant Powers - The Barrier - A Relationship of Abuse? - Conscience - Talking to the Trees - The Oak Replies - Getting to Know You - In the Garden. 10. The Animal Powers - Contradictions - Ethics & Awareness - Animal Spirits - A Bigger Picture - Power Animals - Boundaries - Lions & Tigers & Bears! - Honour Living Things - Field Study - Harmony. 11. Down Between the River & the Railway Lines - Post Industrial Panic - The Old Ones are Among Us! - The Hilltops of South East London - Satori in Blackfriars - Don’t Fool Yourself - City of the Phoenix - This is not a Quest! Dakinis, Djinns & Duppies- Urban Ecology. 12. Another World? - Trance -Questions - Drumming - Exercises - Going Deeper - Taking a Journey - Mediumship - Grounding - Other Worlds? - Faery Lore - Telling Tales - This World & the Next - Little & Big - One World! 13. Weasels, Ghosts & Phobias - The Bogey Man - Shadowy Perspectives - The Spider & the Fly- The Dark Side- Weasels- Fear of Fear- Try to Remember- The Guardian of the Mysteries - Lovelock Meets Lovecraft - Down to Earth. 14. The Art of Memory - Gifts from Faery- Preparation & Uses- The Art of Memory - Overcoming Attachment - Green Wood - The Heart of the Matter. So many of us do not stop just to enjoy the scenery. More than that, we do not explore the world we are part of. We look for the next thing, the next moment, the next place we might be, the next thing we might buy. The edge of the world. We trip blinkered past the ordinary, everyday wonders around us like the worst of tourists when we could be revelling in their richness. We need to stop and enjoy, renew wonder and connection. We need maps and guidebooks. These maps, that compass, are not ones written on paper. They are maps for the soul, compass for the spirit, tools to help us navigate ourselves into the living world. In The Art of Conversation, Barry offers us tools to help renew that sense of connection, providing ways of drawing maps that are rooted in physical experience of the landscape but that we remember and express as poems, songs, stories and ceremonies. More than that, Barry invites us to meet the other inhabitants of our neighbourhood, reminding us that the world is full of more than just humans and other peoples have their perspectives, their agendas and their friendliness. Here is a chance to set up meetings with those people. Sometimes no-one may come to our parties, but however large or small the connection with those other adventurers proves to be, our own eyes should be opened wider, our ears listen deeper to the woods and the maps we draw in our hearts and heads all the richer for our heightened awareness. Barry Patterson has written a beautiful and powerful encouragement and incitement to engage with the world of which we are inescapably members. He combines deep, positive and earthy spirituality with considerable scientific knowledge and presents it in prose and poetry that suggest some rich bardic influence must well up in the English Midlands. Lots of people talk to trees these days but Barry convincingly demonstrates that beauty, health and wisdom may flow from respectful listening. We are called to conversation and now we may begin. I’ve just started reading The Art of Conversation with the Genius Loci by Barry Patterson. Barry is the author of Finding your Way in the Woods widely recognised as the best guide to working magic outdoors. This book is an expansion of that previous pamphlet. Expansion doesn’t really do it justice though, as it’s not just the same text with an appendix bolted on, it’s a completely new book! And it’s fantastic, one of the best books on magic I’ve ever read. It’s really refreshing to read a book that isn’t simply a reworking or re-running through of the established tropes of a system– in fact this might be described as a systemless book, as it focus on experience and games to play while cultivating that experience rather than some abstract metamystical hooey. The first chapter gives an account of a trip to the Outer Hebrides, and what happened to him. And this is simple and refreshing to me., an account devoid of ritual trappings and techniques. In the rest of the book we have accounts/ideas of working in the city, relationship with rocks and stones, consideration of divination, making music and so on. It’s packed with ideas and already, 50 pages in, I’ve chanced on a couple of fragments that have spun my ideas on their head. I particulary like the way he expresses his animism, in a way that straddles “rational” and “magical”. I can’t stress how important it is that you, personally, go out and buy this book right now. Another example of a potentially useful model is Hutchin's concept of ecological hyperspace which was originally used by ecologists to map the interactions between different species occupying niches within an ecosystem. Hyperspace in this context being a "theoretical" n-dimensional space. Its also been used by organisational theorists to examine dependency relationships between companies. However, I was first introduced to the concept by Barry Patterson, author of Finding Your Way in the Woods: The Art of Conversation with the Genius Loci, who proposed that we 'borrow' the notion of ecological hyperspace (it's a good buzzword, after all) and consider the 'genius loci' of a site as an emergent property of a locale's ecosystem (which includes weather systems, rock composition etc.,), history, and other factors. Included an extensive quotation from the introduction. Following the acclaimed booklet Finding Your Way In The Woods, this article was first published in Towards 2012 Parts 4/5: Paganism/Apocalypse (The Unlimited Dream Company, 1998). It forms the basis of a chapter in the new book The Art Of Conversation With The Genius Loci. These books changed my world-view... Finding Your Way in the Woods: The Art of Conversation with the Genius Loci, Barry Patterson. Straightforward notes on outdoor religious practice. I've been reading the excellent The Art of Conversation with the Genius Loci by Barry Patterson. It contains a lot of stuff that is similar in outlook to what I do already, but was very helpful with ideas to expand on it. Wise words indeed! Tree Spirit. I recommend it highly! A. Tickhill, Medicine Ways Magazine. I wish that I had written this book! P.Hine, Pagan News. A neopagan book of distinct singularity. R.N.T, Mercian Mysteries. The style is lucid, unpretentious & free from jargon. A. Begg, Pagan Prattle. It is not complex but is expertly put. O Fortuna! Throw away those dog eared copies of Iron John, this is the real thing. A. Stone, Talking Stick Magazine. ...probably the most important Druidic document to be created for years. S.Wilson, Aisling Magazine. ...the deceptively simple booklet by Barry the Ex Pedant is offered as a framework for people who are unsure where ecology fits with spirituality. T.Hinson, Pagan Dawn, Beltane 1998. "One of the best books on the subject of getting in touch with the Genius Loci." Steve Jones, The Right Times, Autumn Equinox 1998.